Weekly London newspaper The Southwark News is showing its support to businesses affected by the riots by offering free adverts. Today’s edition of the independent title also includes a poster for readers to cut out and put up in their window urging people to support shopkeepers in the aftermath of the London riots. The poster reads ‘Support our local shops – Don’t let the looters destroy our local community’. They are also doing the same same in their sister title the Lambeth Weekender and will run an extra 1,000 copies to be hand delivered to high street shops in the borough. “The very last thing that local business people needed was these riots – not just because of the massive cost of the clean-up operation, but also because of the impact such events can have on trade in general. As the riots continue, Wednesday’s edition of the Croydon Guardian carried 11 pages on the riots, including a four-page wrap of pictures showing the horrific scenes which took place in the town. 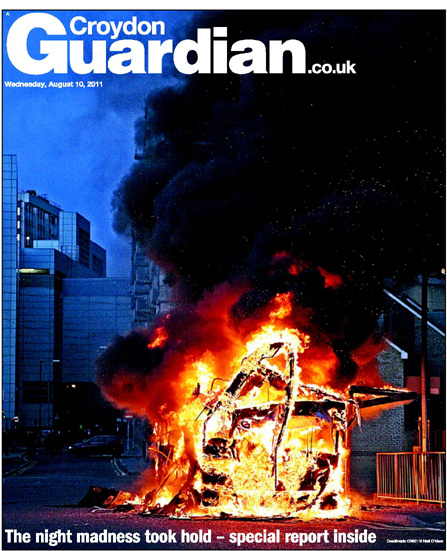 The front page of which showed a poignant image of a burning bus with the words ‘The night madness took hold’. 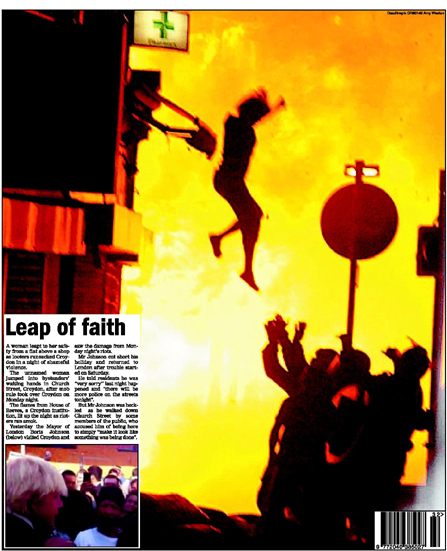 Page four carried a picture of a woman jumping out of a burning building. The picture, taken by agency photographer Amy Weston, has made headlines around the world. Earlier this week HTFP reported on the extensive coverage of the riots by the Enfield Independent, including a riots section which was set up on their website. As a result of this the daily unique visitors to enfieldindependent.co.uk on Sunday accounted for 12 per cent of the total national Newsquest Group Traffic on Sunday. This included 203,000 page views on Sunday from nearly 57,000 unique users. Other newspaper that saw increased web hits include Wolverhampton based Express and Star, which clocked up 853,000 homepage views on Tuesday, and the Bristol Evening Post which saw 150,000 page impressions on riot stories . Well done to Chris and the team at Sothwark News. It is heartening to see the genuine efforts to help the community and restore pride. What a great idea! Well done Chris & all at Southwark News. They’ll make a couple of reporters redundant at Christmas to pay for the free space. Some people that post here are so bitter and twisted. Hacked off, can’t you just accept that someone is doing something good? How about you spend a little less time whingeing on here and go and get a job, you bell-end.